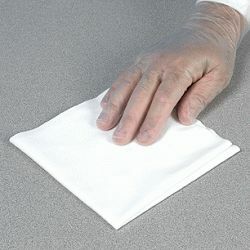 Cleanroom Wipes do for surfaces what cleanroom HEPA filters do for the air by effectively picking up wet and dry contaminants and holding them for disposal. We will help you achieve USP 797 compliance with our selection of cotton, polyester, poly-cellulose blends, nylon, pre-saturated, sponge, and micro-fiber wipes which come in in many sizes to meet your cleanroom needs. Browse the categories below or contact us for help choosing an appropriate wipe.